An incendiary character with a long history of racist and sexist outbursts, he told a female federal deputy that she was not worthy of being raped by him, said that he would be unable to love a gay son and that his children would never have a black partner, as they had been very well-educated. During the 2016 impeachment of Workers’ Party President Dilma Rouseff, who was tortured by the dictatorship, he dedicated his impeachment vote to the colonel who tortured her. These red outlaws will be banished from our homeland. It will be a cleanup the likes of which has never been seen in Brazilian history…. Either they go overseas, or they go to jail. Economically, he proposes a course of shock therapy, appointing a University of Chicago-trained economist, Paulo Guedes, to oversee a fire sale of state assets and an opening up of the country’s vast natural resources for foreign exploitation. The New York Times (10/26/18) reported markets were surging on “hope of a Bolsonaro victory,” claiming his appeal lies in his willingness to enact unpopular privatizations and gut Brazilian pensions. Bloomberg (10/30/18) breathlessly reported that he would be “extraordinarily pro-business.” The CBC (10/26/18) explored the new world of possibilities for profits for Canadian corporations in agriculture, extractive sectors and finance, as Bolsonaro promises to slash environmental regulations and virtually all market restrictions. “It could be a good time to be a mining investor in Brazil,” it reported. It did note in an offhand manner that, as an externality, critics say it could lead to the destruction of the Amazon rainforest. But the Wall Street Journal (10/29/18) went the furthest in its praise for the new president. Its editorial board came out to endorse him as a “credible” “reformer,” describing him as an “antidote” to the greed of the Workers’ Party. It also made the claim that the election was “transparent, competitive and fair,” a remarkable claim, considering Bolsonaro is widely accused of illegally employing foreign companies to create a massive fake news industry via WhatsApp (Guardian, 10/18/18), and that the real frontrunner for the election, Lula da Silva, is in jail on spurious grounds and barred from running, even from his cell. Studying the financial press’ coverage of Brazil reveals a great deal about its priorities and ideology. Faced with the choice of center-left reformers who may tax business slightly more, and outright fascist candidates, the financial press once again made its decision clear, proving that democracy and the health of the stock market often do not mix. 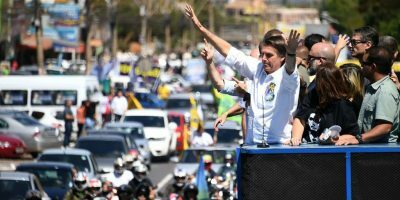 The media appear uninterested in the human cost of Bolsonaro’s near-genocidal statements, nor the cost to the population if pensions are gutted and state assets are sold off, nor the cost to the Amazon, a crucial carbon reserve that must be maintained and strengthened if humanity has any chance of mitigating the catastrophe of climate change. These are mere externalities. When it comes to opportunities for profits, all else is forgotten. After all, fascism is big business.